During Geoff and Christin’s 2018 mission trip to Haiti, Christin and the other ladies from their team had the opportunity to minister to around 50 women at a local prison. Cross to Light, the mission ministry they worked with, has been visiting this prison weekly to hold bible studies and pray for the ladies. It was her privilege to be a part of this crucial ministry. Among the women who attend the bible study regularly only three or four of them had a bible of their own and Cross to Light had five bibles they would bring to share among the remaining women. Unfortunately, these bibles would be returned at the end of each study. 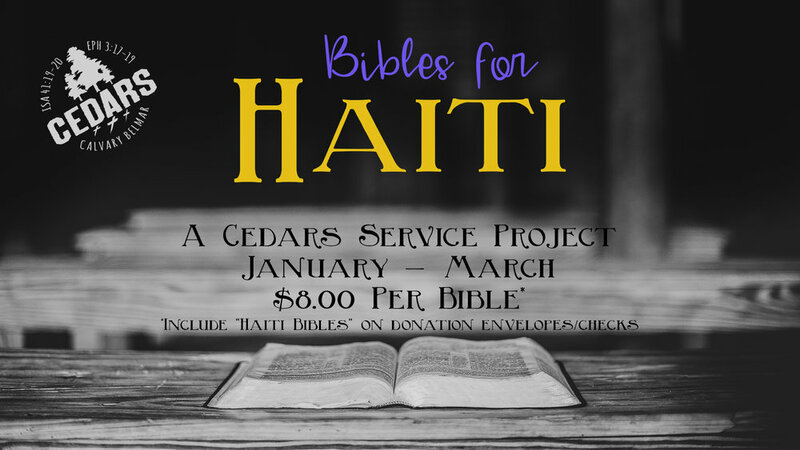 This quarter the Cedars youth group will be raising funds to provide the prison and Cross to Light with bibles in their native creole language. Please specify “Haiti Bibles” on your donation check/envelope. Visit Cross to Light’s website to learn more about their ministry in Haiti. *This is a youth group service project but any donations are welcome. Thank you for your support!